Vegans don't have to miss out on traditional Summer meals with Laura Theodore's all-American Summer recipes for vegans like this mushroom-nut burgers recipe. Put the bread crumbs, Italian or all-purpose seasoning, chili powder, garlic powder, and salt in a large bowl. Put the walnuts in a blender and process in pulses until they resemble coarsely ground flour. Add the walnuts to the bread crumbs and stir gently to incorporate. Put the mushrooms, onion, and tamari in a blender and process to a chunky purée. Add the mushroom mixture to the walnut–bread crumb mixture and stir to incorporate. Place a 3-inch cookie cutter ring on the parchment. Pack one-quarter of the mushroom– bread crumb mixture into the ring and press it firmly and evenly into the ring to form a “burger.” Gently remove the ring. Repeat with the remaining mushroom–bread crumb mixture. Flatten each burger slightly with the back of a flat spatula. Bake for 18 minutes. 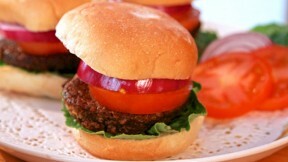 Flip each burger and bake for an additional 15 to 25 minutes, or until the burgers are slightly crisp and golden. Gluten-free option: To make gluten-free bread crumbs, use your favorite gluten-free bread in place of the wholegrain bread. To make fresh bread crumbs, put 3 to 4 large slices of wholegrain bread in a blender and process into coarse crumbs.